Ekovate Air is proud to be the exclusive dealer and installer for AeroBarrier in Washington's King, Pierce, and Snohomish counties. 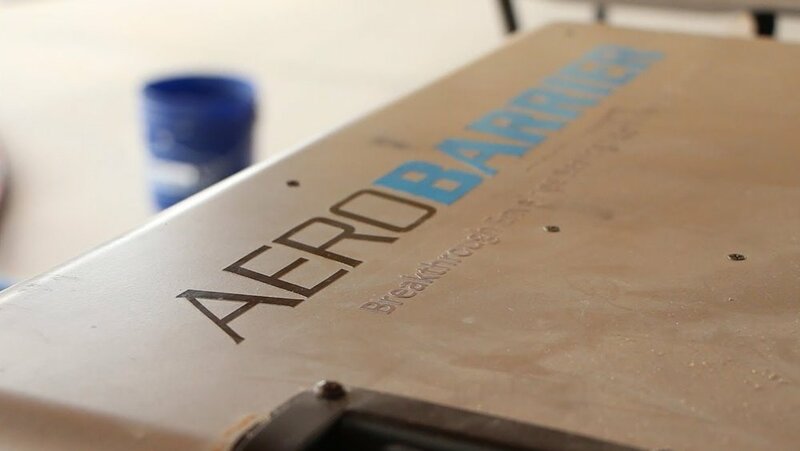 Building upon proven technology invented by the U.S. Department of Energy (DOE) over 20 years ago, AeroBarrier is a cutting edge aerosol envelope sealing system that simultaneously measures and seals building envelope air leaks. Video overview of the AeroBarrier process. Whether your goal is to pass energy code or achieve passive house air tightness, AeroBarrier results are guaranteed. Since your blower door result is monitored live during the sealing process there is no more anxiety, no more guessing, no more mystery. Never fail a blower door test! The latex based AeroBarrier sealant material is Low VOC (volatile organic compound) and GreenGuard Gold certified. After the process the aerosol dissipates in a matter of minutes and leaves only a thin film on horizontal surfaces that can be swept or vacuumed. 2018 NAHB International Builders' Show "Best in Show"
2018 NAHB International Builders' Show "Most Innovative Building Product." Can AeroBarrier be applied to a finished or occupied home? Yes! After the process is complete, the sealant mist settles on horizontal surfaces in a thin film. In a home with finished floors, countertops, furniture, etc it is recommended to cover or mask horizontal surfaces to keep things clean, so the total time on site takes longer time is required to prepare the home. The AeroBarrier sealant does not stick to vertical surfaces like windows or walls. Cost varies based on the number and size of the homes or apartments, the stage of construction, and the air tightness goal. Generally pricing falls in the range of $0.80 - $1.50 per square foot of floor area. How many homes has this been installed on? AeroBarrier has been installed on over 750 homes to date, including every home being built by Arizona based high performance home builder Mandalay Homes. What cleanup is required after the sealing process? When AeroBarrier is applied at rough in or right after sheetrock in new construction there is little to no cleanup required. After the process is complete, the sealant mist settles on horizontal surfaces in a thin film that looks much like drywall dust. At these stages of construction cleanup is optional. If the process is done in a finished home it is recommended to cover or mask horizontal surfaces to make cleanup easier. This does require more preparation before sealing and cleanup after. What is the sealant material made of? The AeroBarrier sealant is a waterborne acrylic that has been used as a fluid-applied permeable air barrier for many years. The sealant is GREENGUARD Gold certified and has been tested according to various ASTM standards and NFPA 285, for fire spread, smoke production, adhesion, antifungal properties, tensile strength, etc. GREENGUARD Gold is a stricter certification criteria than GREENGUARD and ensures a product is acceptable for use in schools and healthcare facilities. The entire AeroBarrier process, from setup to completion, takes approximately 4-hours for a typical single-family home. When targeting reduced envelope leakage levels of Passive House or ZERH, additional time may be required. What size leaks will this seal? AeroBarrier reduced this home’s leakage from 2.28ACH @ 50Pa down to 0.43ACH @ 50Pa. AeroBarrier reduced this home’s leakage from 7.95ACH @ 50Pa down to 1.00ACH @ 50Pa. AeroBarrier reduced targeted PHIUS home’s leakage from 2.14ACH @ 50Pa down to 0.27ACH @ 50Pa. AeroBarrier reduced this home’s leakagefrom 2.66ACH @ 50Pa down to 0.22ACH @ 50Pa. Targeting PHIUS certification, this mixed-use apartment building in the heart of Columbia City will utilize solar thermal to greatly reduce its domestic hot water energy. AeroBarrier was used to compartmentalize the first-floor units to help meet the stringent PHIUS requirement for building envelope leakage.